The plaque is located to the side of the gates to the former prison, in the south-western corner of the kirkyard. The plaque was paid for by the SCMA and erected in association with the Greyfriars' KirkyardTrust. It was unveiled on 30 November 2007 by John Campbell, Treasurer of the Scottish Covenanter Memorials Association. 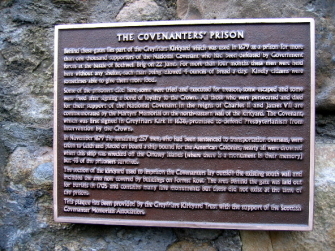 PLEASE NOTE: The SCMA does not control access to the Covenanters' Prison. Please contact Edinburgh Council for further information. Behind these gates lies part of the southern section of Greyfriars Kirkyard which was used in 1679 as a prison for over one thousand supporters of the National Covenant who had been defeated by Government forces at the battle of Bothwell Brig on 22 June. For over four months these men were held here without any shelter, each man being allowed 4 ounces of bread a day. Kindly citizens were sometimes able to give them more food. Some of the prisoners died here, some were tried and executed for treason, some escaped, and some were freed after signing a bond of loyalty to the Crown. All those who were persecuted and died for their support of the National Covenant in the reigns of Charles II and James VII are commemorated by the Martyrs' Memorial on the north-eastern wall of the kirkyard. The Covenant, which was first signed in Greyfriars Kirk in 1638, promised to defend Presbyterianism from intervention by the Crown. memory), but 48 of the prisoners survived. 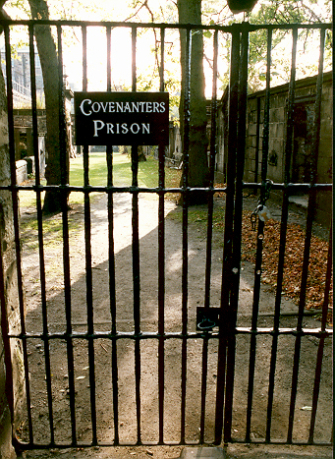 The section of the kirkyard used to imprison the Covenanters lay outside the existing south wall, and included the area now covered by buildings on Forrest Row. The area behind the gate was laid out for burials in 1705 and contains many fine monuments, but these did not exist at the time of the prison. This plaque has been provided by the Greyfriars Kirkyard Trust with the support of the Scottish Covenanter Memorials Association.